The Kerr Foundation Inc. of Oklahoma City, Okla., recently contributed $10,000 to the Truman State University Foundation in support of the Health and Exercise Sciences (HES) Fontaine C. Piper Movement Analysis Laboratory project. The gift was made after the University successfully met the conditions of The Kerr Foundation’s 1:1 challenge grant. The challenge grant was instrumental in helping the University secure more than $18,000 in contributions from HES alumni and friends. When fully funded, the Fontaine C. Piper Movement Analaysis Laboratory will be the leading motion analysis laboratory in the Midwest. The laboratory’s equipment will provide Truman students with cutting-edge technology and experiences and will play a significant role in expanding the depth and breadth of research questions available for exploration. “We are confident that these experiences and opportunities for research will lay a strong foundation for students who wish to pursue careers in the human-services professions, including medicine, physical and occupational therapy, and geriatrics,” said Chris Lantz, associate professor of exercise science and department chair of health and exercise sciences at Truman. The Piper Lab Project recently concluded year one of a three-year fund-raising effort for the project. The gift from The Kerr Foundation pushes the projects total to more than $50,000 toward the overall goal of $100,000. The Department of Anthropology, Geography and Sociology and the Department of Art will sponsor the sixth annual “Archaeology at Truman” symposium. There will be presentations by students majoring in anthropology, art history, biology and history as well as faculty in anthropology and art. The event will take place at 7 p.m. Sept. 27 in Barnett Hall 2217. Several students and faculty will present papers. The Truman Forensic Union launched its 2007-2008 season with an impressive placement at the University of Wyoming’s Top of the Rockies tournament, Sept. 15-17. Among programs entered in the tournament’s two debate divisions, Truman was ranked third behind Washburn University which is located in Topeka, Kan., and the University of the Pacific which is located in Stockton, Calif.
Sarah Backhaus, a freshman political science major from Liberty, Mo., and Kara Mohs, a freshman biology major from Winterset, Iowa, reached the semifinals of the junior varsity division of parliamentary debate and concluded their long run through the tournament at approximately 1 a.m. Monday morning in a debate over energy policy. Backhaus was ranked fifth-best speaker in the division, which was composed of 36 teams and 72 individual students from throughout the Midwest and Rocky Mountain regions. In open division parliamentary debate, the team of Sara Archer, a senior accounting major who is from Riverside, Mo., and Chris Girouard, a junior communication major from Chesterfield, Mo., joined the team of Mark Buchheit, a sophomore history major from Carthage, Mo, and Dylan Rothermel, a senior economics major from Homewood, Ill., in the double-octafinals. The field was composed of 108 speakers and 54 teams. Parliamentary debaters engage in a different debate topic each round—usually on matters of public policy. During the course of the weekend, Truman debaters engaged topics relating to two different Supreme Court decisions, the proposed Access for Afghan Women Act, and the revocation of the “designated hitter” rule in major league baseball, among other questions. In Lincoln-Douglas debate, Rothermel staged a come-from-behind victory in the open division, defeating the top-seeded debater, from Washburn University, in the double-octafinal round, eventually advancing to the quarterfinals (elite-eight) of the tournament. Mohs advanced to the octafinals (sweet sixteen) of the junior division. Archer was ranked sixth-best speaker in the open division. Unlike parliamentary debaters who clash on a different topic each round, Lincoln-Douglas debaters speak on a yearlong topic addressing U.S. aid to the countries of the Greater Horn of Africa. During the course of the weekend, Truman debaters addressed questions related to the diplomatic recognition of Somaliland, veterinary assistance programs to African farmers, and micro credit programs, among other issues. For more information on Truman Forensics, visit the program’s Web site at http://forensics.truman.edu. The Truman Forensic Union is open to all interested students without regard to previous experience. It is a co-curricular program affiliated with the Department of Communication. Patterson will show how the 1909 invention of the first commercially viable method for the synthesis of the simplest nitrogen fertilizer ushered in a new age in agricultural science, but also ushered in the modern age of chemical warfare. His talk will explore the connections between agricultural chemistry and chemical warfare, with a focus on events and personalities of the last 100 years. The Truman Faculty Forum was created in 2003 to give faculty the opportunity to present their research and creative work to the Truman community, and to enhance the importance of scholarship and creativity in the culture of the institution. Patterson has established a research program that focuses on the chemical destruction of nerve agents-the most lethal of all chemical warfare agents. As an amateur history buff, Patterson focuses on examining the historical context of chemical discoveries and their influence on human events. Pam Melvin R.N., B.S.N., a 1984 graduate of Truman and part-time clinical faculty member, received a $10,000 Missouri Hospital Association scholarship to complete a Master of Science in Nursing degree from the University of Central Missouri. She is among 31 nursing students who will receive funding to pursue graduate education requirements for faculty positions at Missouri’s nursing schools. Glamour Magazine is sponsoring a 2008 Top Ten College Women Competition. Winners receive a $3,000 cash prize, a trip to New York City, opportunities to meet with top female professionals and national recognition in Glamour’s June 2008 issue. Applicants must be full-time juniors for the 2007-2008 academic year and have leadership experience, involvement on campus, and in the community, excellence in their field of study and unique, inspiring goals. Applications must be received by Nov. 30 and are available at http://www.glamour.com/news/top10collegewomen. SOF (Seeds of the Future) is offering a scholarship awards of up to $1,000 for those who qualify and meet all requirements. Applicants must be U.S. citizens or permanent residents, must demonstrate financial need and file a FAFSA. Additional requirements include 2.7 GPA and must be enrolled in a program leading to applicant’s desired degree. Students may apply online at anytime during the academic year at http://www.soffoundation.com. 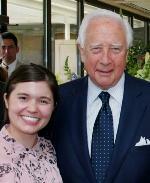 Cassie Mundt (left) with David McCullough (right) during her internship at the Harry S. Truman Presidential Museum and Library. Cassie Mundt, a senior business administration and history double major from Overland Park, Kan., was an intern at the Harry S. Truman Presidential Museum and Library, located in Independence, Mo., this summer. She had a role in the 50th anniversary celebration of the Library, including planning for the visit by historian David McCullough. She also had a large role in planning President Bill Clinton’s visit. The intern usually works in one of a variety of areas at the Museum and Library including archives, public relations, marketing, educational programing, museum development or visitor services. Contact Jeff Gall, associate professor of history and social science education, at jgall@truman.edu for more information about this internship. This year’s Career Expo will take place from 1-5 p.m. Oct. 10 in the Student Union. Now is the perfect time for students to update their résumé and have it critiqued, practice their interviewing skills, and research companies that are coming to Career Expo. Students can have their résumé critiques on a drop-in basis by any of the career assistants at the Career Center. Please come by the Career Center or call 785.4566 for more information. Sept. 30: Deadline to apply for jobs and upload résumés on eRecruiting for companies coming to Expo for pre-screening for Oct. 11 interview slots. Oct. 3: “Career on the Quad,” a session where students can register for Expo, have their résumé critiqued, find out about how to make the most of the Expo experience, and enjoy popcorn, soda and music. Oct. 4: Sign up to practice interviewing skills with the Service Corps of Retired Executives (SCORE). Students may sign-up now in person in the Career Center. In order to interview, students must dress professionally and turn their résumé in 24 hours before the interview. Oct. 8 and 9: Students can practice their mock interview skills with recruiters from Eli Lilly, Steak n’ Shake and Edward Jones. Students must sign-up in the Career Center and dress professionally. Oct. 9: Join Larry Frey from Eli Lilly for “Ace the Interview,” an extremely popular and well-regarded session that provides insight into handling interview situations. Frey’s session will take place in the Career Center classroom from 5:30-7:30 p.m.
Oct. 10: Career Expo takes place. Oct. 11: Interview Day for Expo. After reading a number of books and articles and engaging in hours of discussion, the commission has come to realize that a distinctive curriculum is more likely to occur from modifying and coordinating the way Truman faculty teaches the classes than from designating a unique set of classes for students to take. Truman needs to develop more effective ways to develop and reinforce the full-range of critical thinking, communication and life skills. As the commission drafts new learning outcomes it would like input from the Truman community regarding how pedagogy can be used to encourage the kinds of learning opportunities that would lead students to develop the desired characteristics of Truman graduates that appear in the recently adopted SPAC document. The forums will take place from 3:30-5 p.m. Sept. 25 in the Student Union Building Activities Room and from 3:30-5 p.m. Sept. 26 in Violette Hall 1010. The Commission on Undergraduate Curriculum plans to have additional forums as it moves forward with the curriculum review process. These are the first in a number of forums the commission plans to have during the next two years. Tonic Sol-fa, a cappella quartet, has been awarded numerous original song and album awards in pop, gospel and holiday genres, appeared on NBC’s “Today Show” and in the pages of Newsweek magazine. 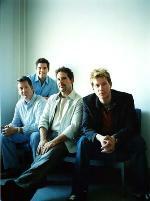 Outings with Jay Leno, Shawn Calvin, Lonestar and Garrison Keillor has propelled album sales to more than 1 million copies and has earned the group thousands of intensely loyal fans. Seating is general admission. Admission is free for students, faculty and staff with their University ID. Students may pick up tickets at the Student Activities Board Office, third floor of the Student Union Building. Faculty and staff may pick up tickets at the Center for Student Involvement, third floor of the Student Union Building. Contact the Public Relations Office at 785.4016 for more information or log on to http://lyceum.truman.edu. An informational meeting about the Missouri Government Internship Program will take place at 5:30 p.m. Sept. 26 in Student Union Building Georgian Room B. Pizza will be provided. The Missouri Government Internship Program offers a unique opportunity for students to intern at the Capitol in Jefferson City, Mo., with a public official, legislator or state agency during the spring 2008 semester. The internship, which is open to all majors, provides an inside look at state government. The interns live in Jefferson City and receive a stipend of $2,500. Interns may earn up to 15 hours of credit. All juniors and seniors are encouraged to apply. Applications are available online at http://career.truman.edu/student/internship/mogov_app.pdf. For priority consideration, completed applications are due by Oct. 10 in McClain Hall 101. A selection committee will review the applications and interviews will be conducted Oct. 17 for the spring 2008 legislative internships. Students may pick up applications for this prestigious award in the Dean of Student Affairs Office, Kirk Building 112. Faculty and staff are also invited to nominate students for this award. Nominations are due by Oct. 5 in the Student Affairs Office. The Office of the Provost is now accepting nominations for the Walker and Doris Allen Fellowship for Faculty Excellence. The Allens established the Fellowship in the year 2000 with a $250,000 gift to the Truman State University Foundation. To date, the program has completed six years of a scheduled eight-year program, with 18 faculty members recognized with awards. Due to favorable investment returns, the fellowships are expected to continue until at least 2010. To nominate an eligible faculty member, send a letter of nomination to the Office of the Provost addressed to the Allen Fellowship Selection Committee. The letter of nomination should be no longer than one page and should address how you believe the faculty member fulfills the selection criteria. Please deliver a signed hardcopy of the letter to McClain Hall 203, send it through campus mail, or by fax to 785.7460. See Web site http://www.truman.edu/pages/131.asp for details, including the selection criteria and a list of prior recipients. Nominations are due to the Office of the Provost by Oct. 1. Required R.S.V.P. was due by Sept. 17. People may attend the presentation sessions at any time. For more information, see http://mcnair.truman.edu. Dave Barnes will be taking the stage for a free, live concert followed by one of the most motivational speakers today, Joe White. He will address the question of Jesus Christ in a compelling, unforgettable way. Campus Christian Fellowship is a sponsor for this event. Contact kjw538@truman.edu for more information. There is a $10 entry fee with a 50/50 pot. Half of the proceeds will go to the winner and the other half will be giving to breast cancer research. Men’s and women’s T-shirts will be available. Alpha Sigma Gamma is sponsoring these events. Contact Suzanne Russell at snr345@truman.edu or 816.805.2255 for more information. The library has added a new database, AnthroSource, with full text coverage of 32 journals in the field of anthropology. People can access this database through the A-Z site index at http://library.truman.edu. Truman’s International Film Festival 2007 runs from Sept. 19 to Nov. 14. Each week, a different international film will be screened for free at 7 p.m. at the Downtown Cinema 8 on the Kirksville Square. To learn more about the festival and the films, check out the http://rcp.truman.edu/internationalfilm.htm. This week’s film is “Indigènes (Days of Glory)” from France, Morocco, Algeria and Belgium. It will be screened Sept. 26. Rachid Bouchareb directed this film, which was released in 2006. Elizabeth Clark, associate professor and department chair of communication, and Mark Smith, assistant professor of communication, have co-authored a study for publication in both a broadcast trade newspaper and a juried journal. The study examines the availability of Issues-Programs Lists, available to the public, from commercial and noncommercial radio stations in Missouri. The Lists outline the community service programming broadcast each quarter. Under FCC rules, the public may inspect the quarterly reports and offer program suggestions to meet the needs of the community. The trade article appears in the latest paper and digital editions of Radio World and may be accessed at http://rwonline.com/pages/s.0046/t.8420.html. A scholarly version of the article will appear in Winter 2008 edition of Journal of Radio Studies. Truman students participated in the research, and Clark and Smith have taken the research into the classroom with a presentation to students in Principles of Communication as an example of scholarly research. Teresa Heckert, professor of psychology, was among 323 delegates, observers, guests, Board members and Society Headquarters office staff to attend the 2007 Phi Kappa Phi National Triennial Convention from Aug. 9-11 in Orlando, Fla. Heckert, attending the convention as a delegate, is a member of the Truman State University chapter of Phi Kappa Phi and was inducted into the Society in 2001. Missouri Voter Registration forms are now available in Kirk Building 112, at the Cashier Window, in the Residence Halls, and at the SERVE Center. For more information visit http://conduct.truman.edu and click on the Voter Registration Link. Informational meetings for Sweet Power: Sugar, Empires, and Slaves in the Caribbean, a six-credit-hour summer 2008 study abroad class, will take place at 6:30 p.m. Sept. 25 in the Student Union Building Alumni Room, and at 5:30 p.m. Sept. 26 in the Student Union Building Georgian Room A. See slides from previous trips, review the itinerary for the next class, planned for May 14-June 4, 2008, and discuss ways to finance the program. For more information, contact Steven Reschly at sdr@truman.edu or 785.4648. The Art of Living Club is offering an intensive workshop in Yoga postures and breathing. Feeling stressed already? Learn to breath, stretch and relax. The Art of Living Course, Sept. 27-Oct. 5, Information and Registration Meeting is at 7 p.m. Sept. 25 in Baldwin Hall 350. Faculty, staff, students and community are all welcome. IT Services invites faculty, staff and students to TechBreak at 1:30 p.m. each Friday in the Student Union Building Room 320. This weekly series is an opportunity to share information about new and existing IT Service offerings. Please join us for snacks and conversation. Additional details and the topic schedule can be found at http://its.truman.edu/techbreak. The bike co-op will be hosting mobile workshops from 3:30-5:15 p.m. the second and fourth Friday of every month on the Quadrangle, warm weather permitting. Help will be free (donations encouraged). There will be a charge for replacement parts. Tools and parts for most basic repair jobs will be available. Critical Mass rides are the last Friday of every month. Contact Cassie Phillips at cphillip@truman.edu for more information. The Truman Equestrian Team is hosting the first stock show of the season. Spectators are welcome and there is free admission. This event will take place from 9 a.m.-3 p.m. Sept. 29 at the Truman State University Farm. Contact Whitney Mahsman for more information at equestrian@truman.edu. The Phi Kappa Phi Fall Luncheon will take place from noon-1 p.m. Oct. 2 in the SUB Alumni Room. For the new members, please know that this will be a casual gathering. There is no need to dress up. At the luncheon, the children’s book drive that PKP is sponsoring this fall will be discussed. Please R.S.V.P. by Sept. 26 to Cole Woodcox at cwoodcox@truman.edu. The second annual Pickler Memorial Library Book Sale will take place from 2-7 p.m. Oct. 2, 10 a.m.-7 p.m. Oct. 3, and from 10 a.m.-4 p.m. Oct. 4 in the Student Union Building Activities Room. Proceeds from the book sale will be used for library materials and programs. For more information, please visit the Pickler Memorial Library Web site at http://library.truman.edu/booksale.htm. Brian Keck, president and chief operating officer of Macy’s Midwest, will speak from 7-8:30 p.m. Oct. 3 in the Baldwin Hall Little Theatre. All students are welcome. Contact Lana Dowell at ldowell@truman.edu for more information. University Counseling Services is sponsoring National Depression Screening Day from 11 a.m.-2 p.m. Oct. 4 in the Student Union Building. An information table will have handouts and pamphlets available on a variety of mood disorders including depression, bipolar disorder, generalized anxiety disorder and post-traumatic stress disorder. Screenings for these mood disorders will occur in Student Union Building Georgian Room A. Students interested in the free screening will complete a short questionnaire (it usually takes less than 10 minutes to complete the screening) and then meet with a University Counseling Services professional to review the results. The counselor will then make recommendations if further treatment is indicated. E-mail ucs@truman.edu for more information.